JERUSALEM (Reuters) - U.S. Secretary of State Mike Pompeo on Wednesday described the heavily armed Hezbollah group as a risk to their fellow Lebanese and conferred with Israel about the Iranian-backed militia ahead of a trip to Beirut. Pompeo, who has been on a regional tour to promote the Trump administration's hard tack against Iran, received a warning from Israel, which worries it may again be in the sights of Hezbollah fighters winding down their intervention in Syria's civil war. "If some(thing) will happen from Lebanon toward Israel, we will hold Lebanon as the responsible (party)", Rivlin said. Asked what message he would take to Lebanon, his next stop, Pompeo told reporters: "We're going to be very clear about how America sees Hezbollah and our expectations about how Lebanon's success depends on the Lebanese people (demanding) that a terrorist organization not be in control of their government and not drive policies and create risk for their country as well." In Lebanon's 2018 elections, parties and individuals who back Hezbollah's possession of a military arsenal won a majority of seats in parliament. President Michel Aoun called Hezbollah's arms "an essential part of defending Lebanon", though Prime Minister Saad al-Hariri said its weapons were illegitimate. Pompeo also reinforced Rivlin's veiled warning that Israel could retaliate against Lebanon for any Hezbollah attack: "We all know the risk, right? Hezbollah does something inside of Lebanon, the risk of escalation is real. "The people of Lebanon don't want that. The people of Israel don't want that. The people of the United States of America don't want that." For its part, Israel has carried out repeated air strikes on Hezbollah in Syria, where the Shi'ite Muslim militia - along with Russian air power - helped President Bashar al-Assad turn the tables against mainly Sunni Muslim rebels and militants. Iran has faced economic hardship since U.S. President Donald Trump withdrew last year from the 2015 nuclear deal between Tehran and world powers and reimposed sanctions. In a speech broadcast on the Persian New Year on Thursday, Iranian Supreme Leader Ayatollah Ali Khamenei said the Islamic Republic had successfully resisted "unprecedented, strong" U.S. sanctions. Pompeo told Rivlin that Hezbollah, along with Palestinian Hamas and Yemen's Houthis - both also Iranian-backed - "are determined to wipe this country (Israel) off the face of the planet and we (the United States) have a moral obligation and a political one to prevent that from happening." 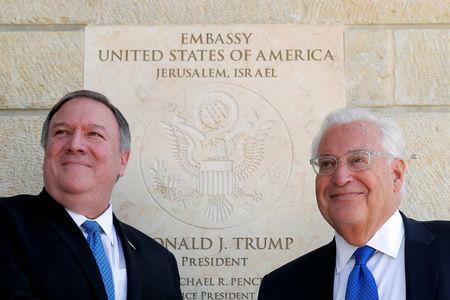 Coming just three weeks before a closely contested Israeli election, Pompeo's trip to Jerusalem was widely seen in Israel as a boost for the prime minister, who enjoys a close relationship with Trump.